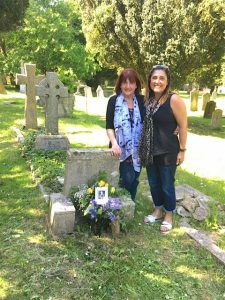 On May 17th Carole Boardman (nee Pitkin) and her daughter Olivia travelled almost 200 miles to visit Berkhamsted to find family graves in Rectory Lane Cemetery. Carole knew that her grandfather Walter Pitkin had died when she was just a baby, but while growing up she knew only about her mother’s relatives close by in the Manchester area. The availability of information on the Internet and her own grand-daughter’s passion for history, led Carole to research her antecedent. She was astonished to find that the Pitkin family was a very honoured and long-standing family throughout Berkhamsted history and that Walter Pitkin as a member of the council had been influential in the development of the town in the 1920s and 30s. “We were the only Pitkins in the Manchester phone directory when I was growing up” she said, “and now I have discovered I am from quite a long-established Berkhamsted family including a former head of Berkhamsted School, whose children William and Martha went to Hartford Connecticut US in 1643 and each started a dynasty there. Carole’s grandfather was Walter Pitkin (1882-1945) and on leaving school he became a solicitor’s clerk. In 1905 he married a local girl Edith Mary Ward and they set up home in 19 Kitsbury Road. Walter was elected to the Berkhamsted Urban District Council. During his time on the Council the new Secondary School at Greenway was planned and with the outbreak of war Walter masterminded the arrangements for the schooling of the evacuees. He became Chairman in 1938 and the most notable event of this era was his laying of the foundation stone of the new Civic Centre and overseeing its subsequent official opening on 14th October 1938. This was the first opportunity that she and Olivia have had to visit Berkhamsted and the pair were fascinated to find the many connections that they had in the town. They visited the graves of Walter and his father and mother as well as one of his siblings Cecil, who died as a child of 5.